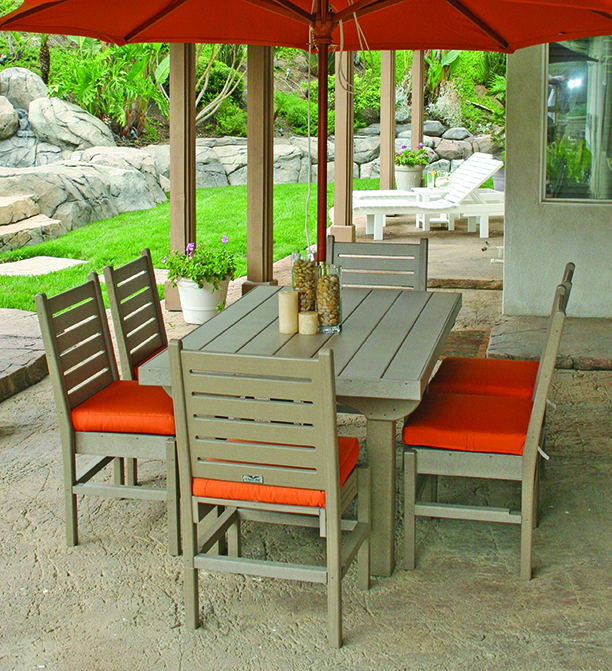 Wittek Golf Supply, a P&W Golf Supply company released a handful of brand-new outdoor furniture lines for the new year, all made from recycled plastic and available in six colors. Upon acquiring Eagle One in 2017, Wittek has had the capability to manufacture everything recycled plastic in-house at their California location, in addition to creating custom flags and signage on location as well. Wittek’s updated furniture lines now contain dining tables, stackable chairs, deck boxes, bars and many more products for your course, patio and clubhouse area. “We’re really excited to be revealing these furniture lines this year”, said Sam Vance, a sales professional at Wittek Golf, “The best part is, every recycled plastic piece we released is made in-house, which means everything from trim, paneling and custom logos can be changed to fit your course’s needs. That’s something that our competition simply cannot do.” Wittek’s recycled plastic products are available in black, brown, green, driftwood, white, and a brand new “walnut” color which has the look and texture of a real hardwood surface. Wittek debuted their walnut collection at the 2019 PGA Merchandise show and received outstanding reviews and an impressive amount of sales to start the new year. All these new pieces are available to order both online at wittekgolf.com and over the phone at 1-800-869-1800.